Question: How to restrict a class from creating multiple objects? Restring a class from creating multiple objects or restricting class from creating not more than three objects this type of interview questions will come for experience interview or written tests. 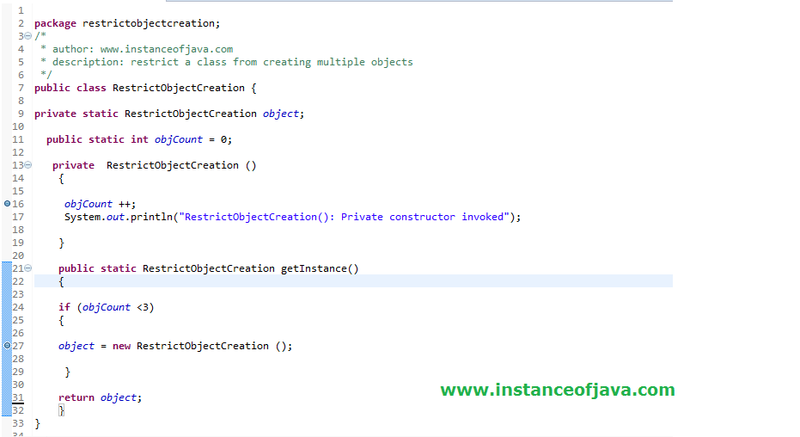 Yes we can restrict a class from creating multiple objects. As we know using singleton we can restrict a class from creating multiple objects it will create single object and share it. As we can access static variables in constructor and static variables are class level we can stake help of static variable to count number object created. By printing the hashcode() of the object we can check how many objects created. 2.Five different ways to create objects in java?